Project Eleanor human rights blog: How easy are treaty body recommendations to understand? How easy are treaty body recommendations to understand? Concluding observations are a key output of the human rights treaty body system. Each state report is reviewed and discussed with the government concerned and then a report is issued of the treaty body's conclusions and recommendations. In 2014, there were 130 such reports, approximately 1400 pages and 6700 total recommendations. How readable are they? How easy are they to understand? Of course readability is not the only relevant measure of treaty body effectiveness, but it is an area where improvements are perhaps possible. One way of assessing readability is to use one of the well known formulas for assessing complexity of written text. 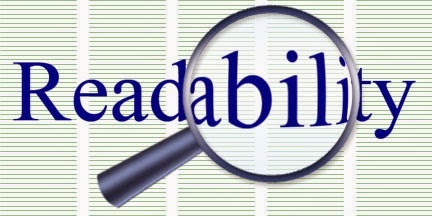 A readability score, for example, can be obtained for any English language work at Readability-Score.com, which uses several formulas including the Flesch-Kincaid reading ease method. The website uses a procedure that counts the words, syllables, and sentence length in any text that you copy-paste into the text box on the homepage. A useful description of this and other readability assessment methods are discussed in this Wikipedia article. A "good" reading score is a matter of some debate but would at least be anything above 60, with a grade level score of approximately 12. A score between 90 and 100 is said to be easily understood by an average 11 year old child. A score between 60 and 70 is easily understood by a 13-to-15 year old child. This assumes of course that the child is in school and is fluent in English. Scores of 30 and below are best understood by university graduates. For example, if you take the first set of scores in this table, the recommendations of the Subcommittee on Prevention of Torture (SPT) scored 41.6 in reading ease, meaning the recommendations could apparently be easily understood by someone with at least 13.4 years of schooling (a person who had graduated high school and had 1.4 years of college). By contrast, the Universal Declaration of Human Rights (UDHR) has a readability score of 50.2 and an average grade level of 10.7. From this scoring summary it would seem that there is room for improvement. None of the treaty body samples reached the "good" range of 60 or above. None reached the 50-level that the UDHR achieved. None is easily readable at the level of a high school graduate (12 years). Seven of the ten received scores below 30, meaning they are geared toward a university graduate school or above level of comprehension. In fact the Committee on the Rights of the Child (CRC) produces recommendations that are the most complex of these 10 samples, requiring on average at least 19 years of schooling to be easily understood; clearly they are not currently drafted in a way that can be easily understood by a child, even though perhaps children are or should be part of the intended audience. Modifying your drafting style to create a more readable text is not an easy task, especially given the time constraints and subject matter faced by the human rights treaty bodies. Indeed, the relatively higher readability scores of the SPT may partly be explained by the difference in modality of their report preparation. The SPT drafts its reports after country visits and between sessions, rather than during the session when the report is being discussed with the government concerned. However, regardless of difficulties in finding the time to improve the writing style of their concluding recommendations, it would seem to be a worthwhile effort to consider as the treaty bodies focus on methods of improvement.